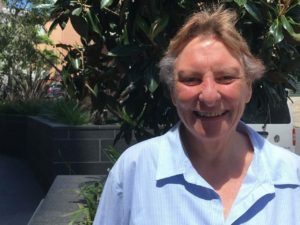 When she retired a few years ago from customer service at a Lane Cove village bank, Pam Bruce wanted to keep in touch with people and the area … so her thoughts turned to volunteering. Pam is from Marsfield yet Lane Cove is where she likes shopping, and keeps appointments with professionals she’s known for years. Being in the neighbourhood, Pam knew of Sydney Community Services and was aware that many SCS services relied on volunteers. “I rang and said I’d like to do whatever was needed – except gardening because I’d kill most plants!” she said. At the time, SCS catering was short of hands for our fortnightly social lunches in the Park View Cafe. That suited Pam well – coincidentally she has qualifications and experience in catering. Pam has been on deck every Monday fortnight since 2014 in the commercial kitchen at Lane Cove Community Hub.